Hmmmm...Where to start? One thing I'm OBSESSED with are Super Sticky Post-It Notes! I "loves me some" Post-Its, but when they came out with the Super Sticky versions, I had to have them. In every size. In every color. Regular and Pop-up. Then, I started telling all of my teacher friends about them and now they have a terrible obsession, too! I also love the plastic tabs. They are everywhere in my books and planners. I had two that just hopped through my planner and they only started to fall off after about one year of use! I know, right?!? I even joined their FAN CLUB Post-It Perks group, which sends me coupons and notifies me when there is something I must have really can't do without. 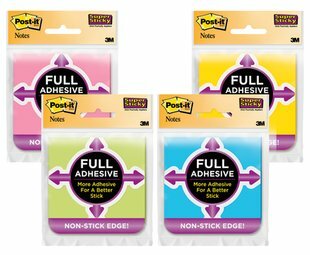 Now they have SUPER STICKY FULL ADHESIVE notes for when you really, really, REALLY want it to stick! *Sigh* Post-It Heaven! Schneider Slider Memo XB Pens (the purple one, especially). They write like butter and the pen has a slightly rubbery texture so they are easy to grip. Ooohhhh! Imagine how awesome they'll be writing on a Super Sticky Post-It!!! Paper Pro Staplers and Easy Punch Hole Punches save you from wrist injuries when you're trying to staple posters to your walls that aren't meant to be stapled (yeah, you heard me, Mr. Wall). I found out they even staple into nice thick, hardwood doors. The hole punches and staplers are easy enough for little kiddos to use. In fact, a child ended up finding out that they are easy to use and they will staple into your finger (if you really want to find that out the hard way). OK...I have more must-haves, but that will have to wait for another post. I make computer log in sheets for the kids so that they can use them at school to log on and I send a copy home so kids can use the sites for homework. Easy-peasy. Sorry...I'm going to try to win that give away, too! Hi! Oh how I love that pen. I have to FIND it. I love a good juicy purple pen. Great idea with the log in list for the firsties. I will have to steal that idea. 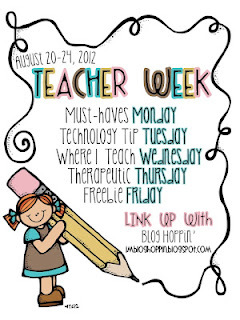 I'm a new blogger stop by for a visit and some freebies you might be able to use in your writing center. You can find the pen at Office Depot in multi-packs and in singles. My hubby even bought a blue one to do his Sudoku puzzles. They are sooooo smoooooth to write with! I'll pop over to see you, soon! Oh I must have those post-its! I am a post-it junkie! I use them so much. P.S. Love the card to post computer logins and passwords! I will have to head to office depot to get some of those pens! I LOVE pens that write awesome! and those post-it's I am going to have to get some this week! I use them all the time!